Munising has everything you need to create the perfect adventure vacation: Great lodging options, restaurants, shopping and services. Munising is also home to the Pictured Rocks National Lakeshore, which is comprised of over 15 miles of shoreline along Lake Superior with sandstone cliffs reaching 200’ in height, and along with the Hiawatha National Forest offer endless recreation opportunities. Explore 17 unique waterfalls in and around the Munising area. The Hiawatha National Forest has two districts - experience the Rock River Canyon & Big Island Lake areas. 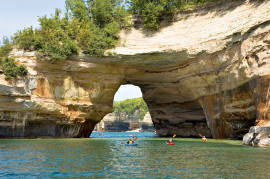 Also discover Grand Island - this gem of Lake Superior has so many fascinating things to see or do. You can hike, bike, or take a bus tour of the island. Please visit our Attractions page and Activities page to learn more.